Hyder was our last stop in and through Alaska. We left Washington almost six weeks earlier on our journey to Deadhorse, Alaska at the top of the world. We were due back in Seattle in two weeks so that Lindsay could fly back to Florida for her next intravenous infusion to treat her Crohn’s Disease. All that was left for us was to see the glacier, watch bears eat fish and have a halibut sandwich on our way out of town. 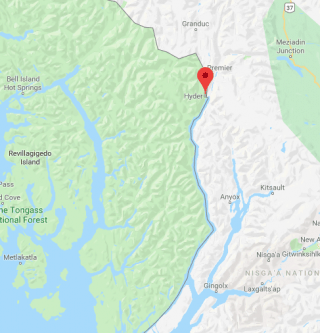 To reach Hyder you must drive through British Columbia and the small Canadian town of Stewart. As we arrived in Stewart we were dismayed to find there were no suitable places to camp or boondock. This accelerated our decision to enter Hyder. With daylight still stretching into the late hours of the night we could grab our sandwich and head out toward the glacier to camp. The next morning we would check out the glacier one last time and swing by to watch the bears hunt salmon on our way out of town. It was a simple plan. But as we’ve learned, even the simplest plans are subject to change. Despite being considered a “ghost town,” with only sixty or so residents, no stop lights and only two main roads, it was difficult to find “The Bus.” We stopped at the only place on the one road into town that showed signs of life and acquired directions. We shrugged, considering now we only had two things to do in Hyder. Then we snapped a few photos and started back toward the truck. Then I heard two men talking. Had we been any sooner or later in arriving at the bus we would have missed this subtle opportunity to interject our lives into this man’s life. However, as most things in our trip have gone, for better or for worse, the timing was just right. As soon as the man finished his last sentence I could feel the wheels churning in my head. 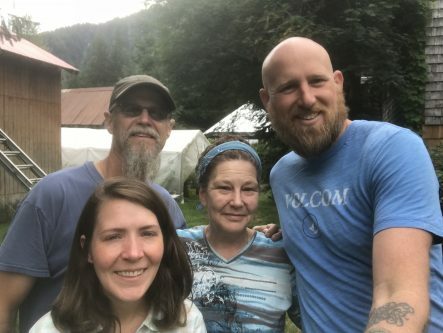 Had we not become so much more extroverted as a result of this journey we were on, we might also have ignored his statement and carried on our way toward Seattle. But we had grown sensitive to searching for and observing needs in other people. After all, this was the primary purpose of our journey. We were on a mission to travel the world, and to help people. Could an offer to go fishing really be helping someone? I approached the man and introduced Lindsay and myself. 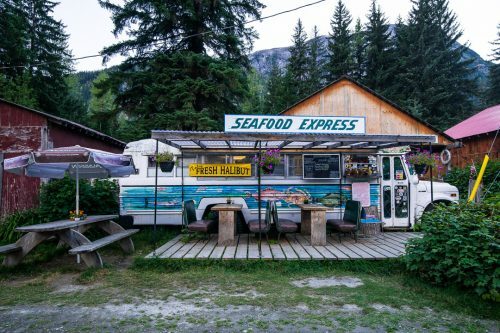 He introduced himself as Jim and confirmed the fact he was both the co-owner of The Bus and the fisherman responsible for fresh halibut on the menu. He went on to share that his first mate was absent, indefinitely, and his commercial quota of halibut was hanging over his head. The season was wrapping up and the fish were few and far between. 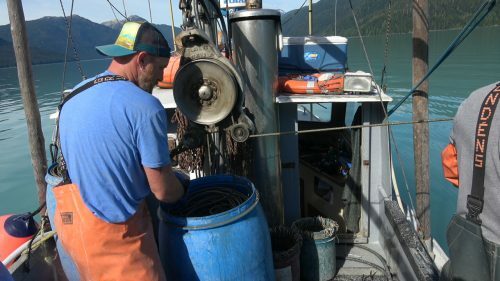 But as a commercial fisherman, if he did not catch his quota this year it would be reduced the following year. “So would your wife be OK if my wife and I accompanied you on a fishing trip,” I asked with a peculiar confidence. “You want to come fishing,” he asked incredulously. Jim ran over to the door of The Bus and yelled inside to his wife Diana. 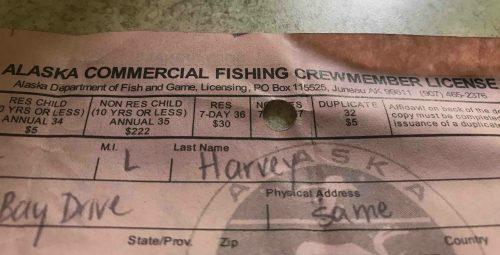 “How much is a one-week fishing license,” he asked. “OK, so here’s the deal. I’ve got two people going fishing with me in the morning. Let’s get the paperwork done,” Jim continued in her direction. 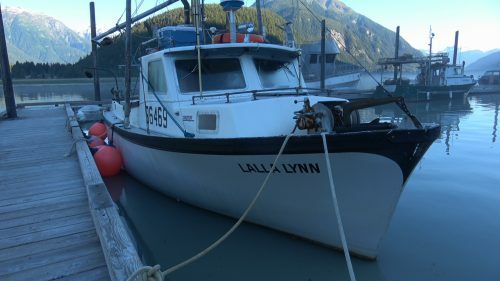 Visiting Alaska on such a limited budget, and then experiencing several breakdowns left us wanting for adventure. We befriended a man in the Yukon that offered for us to fish at his fish camp only to find out days later that his camp had washed away. We also became excited when we reached Homer spit and saw fishing boats and advertisements everywhere. But those were several hundred dollars for each of us for only a half day of fishing. The best we could do was to make friends with some gentlemen in Seward who gave us some halibut. This was, in a way, our fishing redemption. A Deckhand license was good for one week (hint hint)! It seemed strange to consider that going fishing could also be helping someone. We loved fishing. Being shut out from opportunities in Alaska only increased that desire. And to be able to use that passion to help out our new friend was a dream of sorts. We completed the paperwork for the license and agreed to meet at the dock at 10 am sharp. The tide would be going slack shortly thereafter and Jim wanted to have the hooks in the water soaking by the time the tide started to push its way back in. We sort of understood what he was saying. Tides were always important when fishing back in Florida. But we had no idea about the kind of fishing we would be doing. We were just excited to have a chance to get on the water. Even if we didn’t catch anything, the boat ride alone through the canal would be worth it. The next morning we met Jim at the dock and joined him on his boat. He was as surprised that we showed up to fish as our friend Isaac was that we showed up to pick cherries before we left for Alaska. Jim cranked on the engine and let her run just long enough to warm up. As soon as he recognized the familiar hum he cast off the dock and led us out into the canal. We were going fishing in a very interesting place. Because of Hyder’s location, pinned in by Canada, the canal was equally divided between US and Canadian territory. We stuck to the US side as we motored almost two hours down the canal. Lindsay took the helm. I spent half my time helping Jim prepare the hooks and the other half standing in absolute awe of the scenery around. Jim was a long-line fishermen. 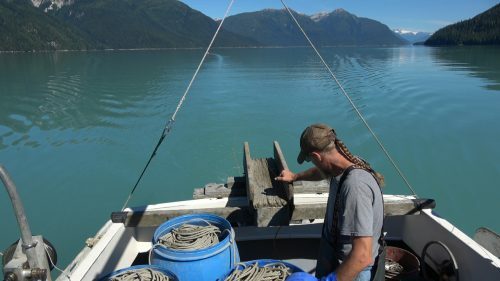 This meant that we were going to set 300 hooks at a depth of around 1,000 feet. Anchors on either end of the line would drag the hooks to the bottom while buoys would pull the line taught to the surface. There was an art to this kind of fishing just as there was in other forms. Jim had his suspicion about the depth at which we needed the hooks to sit and the approximate 2-mile route Lindsay would have to guide the boat as he sent the hooks overboard. Jim preparing to set the lines in the water. 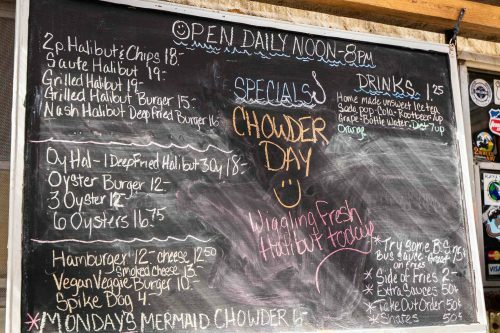 If we were too shallow, the halibut wouldn’t be around to eat the bait. 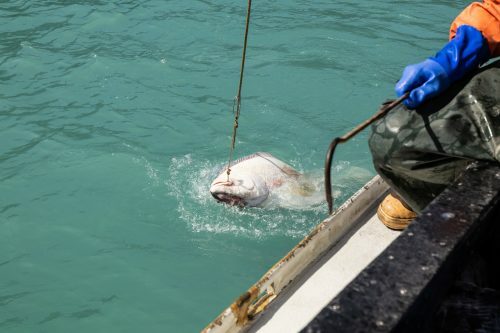 If we were too deep, the hooks would dangle too far above the seafloor to entice the halibut. As the hooks “soaked” for nearly three hours we talked about life, our journey and the road ahead. Jim shared his story of coming to Hyder when he was 14 and of learning to live off the land. He was the Great Alaskan Story wrapped up in a contagious, optimistic energy. Despite this general enthusiasm toward life, Jim was a little skeptical of our chances. He hadn’t fished this particular area in some time. He was doubtful we’d have any success. But Lindsay and I felt otherwise. We had prayed for a bountiful harvest. We knew Jim and his wife needed us to catch fish. It was all we could do to hope that we would. We hooked the float on one end of the line after the soak was complete and set it into a system of pulleys. 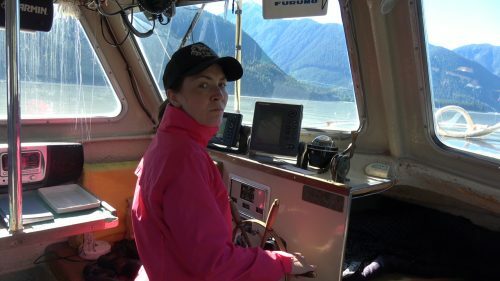 My job was to make sure that the line all spooled nicely into 55-gallon drums on deck and to offer assistance in gaffing and landing any large halibut. Lindsay remained at the helm and was also the in-house photographer and cheerleader. Jim was, well, whatever he needed to be to ensure that fish made it onboard and we returned home safely. Lindsay spotted the first halibut of the day! 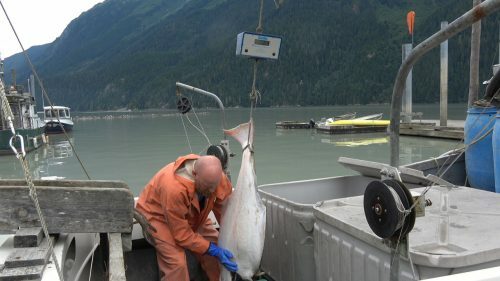 Jim leapt into action and we started the process of gaffing and hauling the halibut into the boat. He estimated that first fish was around 70 pounds. By the end of the day we would have six more like it. 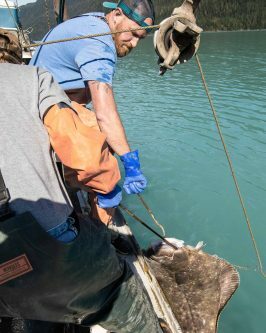 We’d also have a handful of black cod, lingcod and a few smaller halibut. We made great progress toward the quota. After weighing the fish the next morning Jim still had around 600 pounds of fish to catch. But we knew that we caught enough fish to keep The Bus open for the remainder of tourist season. The quota could wait for another day. And it would. Because before the day was done Jim invited me to head out on “the big trip.” This would be a 6-hour trip out, around 6 hours to soak and haul and another 6 hours back. In other words, it was an adventure one could expect to read about in a Hemingway or Jack London novel.